Firstly you are required to have a license server configured for a valid license of VI-Grade. Secondly, for some of the VI-Grade products, you will require a license server for the Adams solver. In some cases the license for the Adams solver will be incorporated in the VI-Rail license, however if this is not the case and a separate license is required, you can view the process of configuring the Adams solver license server in MSC FlexLM License installation. Configuring a license server for use on a single computer. Adding a new license to an existing license server. Configuring a license server on a network based computer for multiple users. In order for a license file to be created, you will have to provide some details of the computer on which the license server will be configured. To easily get this information you can run the VI_Licensing_gethost.exe programs on the computer for which a license file is required. This will create a file named lmxhostid.txt which contains both the HostID as well as the computer name which is needed to create a license file. NOTE: The license file will only be valid to configure a license server on this computer. Once you have received your VI-Grade license file you can configure the license server. To do this, run the VI-Licensing_setup.exe file. In this window under License File, enter the path or click the browse button to find the license file that you have received. Ensure that the correct port is entered and select next to configure the license server. This will install and configure the license server at the location specified earlier in the installation. It will also create a copy of the license file in the install directory. After you have received a new license for your VI-Grade products, it is required that you specify the new license file, which the license server will use. 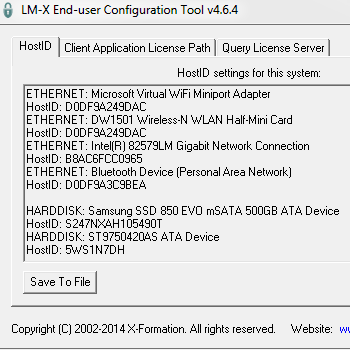 Open the license server by opening start and searching for LMX Config Tool. Under Client Application License Path select Add File and select the new lic file created earlier. Stop the license server by opening start and searching for Stop Server. Start the license server by opening start and searching for Start server. To check the status of the license server, also in the LMX Config Tool, under the Query License Server tab, type the Host name or IP address and click on Perform. This will display information for the current license server. If you are running VI-Grade products on your computer while using a network based computer to host the license server, you will have to point to that computer so that the software looks to that computer to find a license. For more information on setting up environment variables to point to network based license servers, view the Pointing to a network based license server section in MSC FlexLM License installation. Also for information on troubleshooting common licensing issues, view the Troubleshooting some simple licensing issues section in MSC FlexLM License installation.